Kathryn Lasky is probably best known for her Guardians of Ga'Hoole series about owls, is also the author of twenty non-fiction books for kids on subjects ranging from spiders to sea turtles to the rain forest and lemurs to Phyllis Wheatley, John Muir, Sarah Breedlove Walker and Joshua Slocum, the first man to sail around the world alone. With One Beetle Too Many, Lasky brings us a fantastic biographical look at the life of Charles Darwin in bite-sized chapters that are sure to spark curiosity in readers. Matthew Trueman's illustrations are engaging and intricate while maintaining a playful tone that reminds me of the wonderful DB Johnson, author and illustrator of the superb picture books about Henry David Thoreau in which Henry is a bear, starting with Henry Hikes to Fitchburg. Best of all, One Beetle Too Many is now available in paperback! Lasky divides Darwin's life into seven short chapters, all of which are enhanced by one and sometimes two full page illustrations. Beginning with the chapter titled, "One Beetle Too Many," Lasky tells us of Darwin's childhood as one of six children. The son of a doctor and a mother who raised fancy pigeons, Charles was allowed significant freedom. He used his time exploring nature and collecting beetles. One of the best stories Lasky shares, the one that gives the book its title, tells of the time that Charles uncovered a piece of bark and discovered two beetles he had never seen before. Seconds later, a third strange beetle crawls out and Charles, with his hands full, pops the beetle in his mouth so he can run for his collecting bottle. Lasky shares Charles' struggle to find an occupation and please his father. Charles, most likely because he was studying subjects he was not interested in, was a poor student. He failed at medical school and, as a last resort, was sent to Cambridge to study theology and become a cleric. There Darwin met botany Professor John Henslow, the man who would recommend him to serve on the Beagle as a naturalist, changing his life forever. Lasky devotes four chapters to the wondrous explorations Darwin made during the five years that the Beagle sailed the seas. Lasky's final chapter is titled, "The Idea that Scared the World," and covers the personal issues Darwin struggled with as he came to understand the import of his scientific observations. Lasky succinctly and tactfully describes Darwin's growing realization that "living things on Earth changed to better fit with their environment" which stood in opposition to the many people who believed "the story of Earth's formation as described in the Bible." She also does a fine job illuminating Creationists beliefs and why maintaining them was so important to believers. Although plagued by a mysterious stomach illness, one that seemed to flare up when Darwin attempted work on his book, The Origin of the Species. Darwin felt that his "notions did not disprove God in the least but in fact made God more powerful." Despite this, he did not rush to finish his book until he realized that others were already formulating the same ideas. Wanting to be the first to present his idea of "survival of the fittest," Darwin published his book on November 24, 1859 and on that day, all 1,250 copies sold out. Lasky ends her book with Darwin continuing his observations of the natural world and, as his wife Emma said in a letter to their son Leonard, "Father . . . has taken to training earthworms but does not make much progress as they can neither see nor hear." There is a biography at the end of the book and, I wish there had been a timeline as well. Lasky ends her book with this wonderful quote from Darwin, "I am a compete millionaire in odd and curious facts." 2009 was the 200th birthday of Charles Darwin (and Abraham Lincoln!) 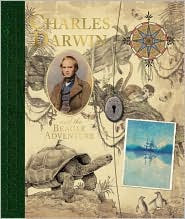 and saw the publication of the thorough and thoroughly intriguing Charles Darwin and the Beagle Adventure, an extremely visual biography that includes fold-out maps, letters in envelopes and other goodies to discover as you read. 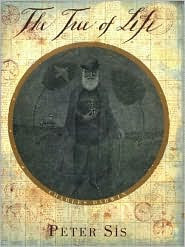 The Tree of Life by Peter Sís is yet another spectacular biography of this infinitely fascinating man. Older readers (of all older ages) should be sure to seek out Deborah Heiligman's multiple award winning book from 2009, Charles and Emma: The Darwins' Leap of Faith, which explores the role that Darwin's marriage and the religious views of his wife played in his scientific life. ONE BEETLE TOO MANY. Text copyright © 2009 by Kathryn Laky. Illustrations copyright © 2009 by Matthew Trueman. Reproduced by permission of the publisher, Candlewick Press, Somerville, MA. Looks amazing! We're fans of the Henry series, and I was glad to see that our library has copies of this one too. Thanks (yet again). Your library continually amazes me (and fills me with a touch of envy...) Fantastic! Not sure if you are fans of Rene Magritte, but DB Johnson's (Henry Hike) next picture book Magritte's Magic Hat that comes out soon.